Ulaanbaatar, formerly anglicised as Ulan Bator /ˌuːlɑːn ˈbɑːtər/ (Mongolian: Улаанбаатар, [ʊɮɑːm.bɑːtʰɑ̆r], literally "Red Hero"), is the capital and largest city of Mongolia. The city is not part of any aimag (province), and its population as of 2014[update] was over 1.3 million, almost half of the country's total population. Located in north central Mongolia, the municipality lies at an elevation of about 1,300 meters (4,300 ft) in a valley on the Tuul River. It is the country's cultural, industrial and financial heart, the centre of Mongolia's road network and connected by rail to both the Trans-Siberian Railway in Russia and the Chinese railway system. Location of Ulaanbataar in Mongolia. The city was founded in 1639 as a nomadic Buddhist monastic centre. It settled permanently at its present location, the junction of the Tuul and Selbe rivers, in 1778. Prior to that occasion it changed location twenty-eight times, each new location being chosen ceremonially. In the twentieth century, Ulaanbaatar grew into a major manufacturing center. 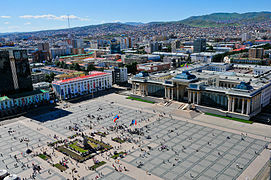 Ulaanbaatar is a member of the Asian Network of Major Cities 21. The city's official website lists Moscow, Hohhot, Seoul, Sapporo and Denver as sister cities. Ulaanbaatar has been given numerous names in its history. 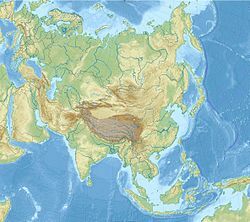 Before 1911, the official name was Ikh Khüree (Mongolian: Их Хүрээ, "Great Settlement") or Daa Khüree (Даа Хүрээ, dà, "great"), or simply Khüree. The Chinese equivalent, Dà kùlún (大庫倫), was rendered into Western languages as "Kulun" or "Kuren". 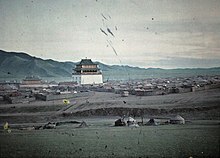 Upon independence in 1911, with both the secular government and the Bogd Khan's palace present, the city's name changed to Niĭslel Khüree (Нийслэл Хүрээ, "Capital Camp"). It is called Bogdiin Khuree (Богдын Хүрээ, Bogdiĭn Khüree, "Great Holy Khan's Monastery") in the folk song "Praise of Bogdiin Khuree". In western languages, the city at that time was most often referred to as Urga (from Mongolian: Өргөө, Örgöö, "Palace"). When the city became the capital of the new Mongolian People's Republic in 1924, its name was changed to Ulaanbaatar (Улаанбаатар, Ulaanbaatar, classical Mongolian Ulaganbagatur, literally "Red Hero"). 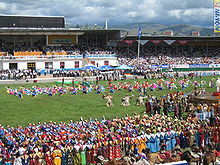 On the session of the 1st Great People's Khuraldaan of Mongolia in 1924, a majority of delegates expressed their wish to change the capital city's name to Baatar Khot ("Hero City"). However, under pressure from Turar Ryskulov, a Soviet activist of the Communist International, the city was named Ulaanbaatar Khot ("City of Red Hero"). In Europe and North America, Ulaanbaatar continued to be generally known as Urga or Khure until 1924, and afterward as Ulan Bator (a spelling derived from Улан-Батор, Ulan-Bator). The Russian spelling ("Улан-Батор") is the Russian phonetic equivalent of the Mongolian name, according to Russian spelling conventions. This form was defined two decades before the Mongolian name got its current Cyrillic script spelling and 'Ulaanbaatar' transliteration (1941–1950); however, the name of the city was spelled Ulaanbaatar koto during the decade in which Mongolia used the Latin alphabet. Today, English speakers sometimes refer to the city as UB. Human habitation at the site of Ulaanbaatar dates from the Lower Paleolithic, with a number of sites on Bogd Khan, Buyant-Ukhaa and Songinokhairkhan mountains, revealing tools which date from 300,000 years ago to 40,000–12,000 years ago. These Upper Paleolithic people hunted mammoth and woolly rhinoceros, the bones of which are found abundantly around Ulaanbaatar. A number of Xiongnu-era royal tombs have been discovered around Ulaanbaatar, including the tombs of Belkh Gorge near Dambadarjaalin monastery and tombs of Songinokhairkhan. Located on the banks of the Tuul River, Ulaanbaatar has been well within the sphere of Turco-Mongol nomadic empires throughout history. Wang Khan, Toghrul of the Keraites, a Nestorian Christian monarch whom Marco Polo identified as the legendary Prester John, is said to have had his palace here (the Black Forest of the Tuul River) and forbade hunting in the holy mountain Bogd Uul. 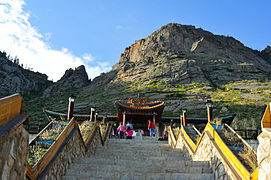 The palace is said to be where Genghis Khan stayed with Yesui Khatun before attacking the Tangut in 1226. 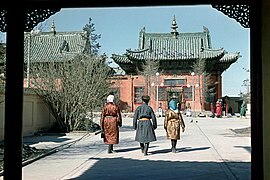 Founded in 1639 as a yurt monastery, Ulaanbaatar, originally Örgöö (palace-yurt), was first located at Lake Shireet Tsagaan nuur (75 kilometres (47 miles) directly east of the imperial capital Karakorum) in what is now Burd sum, Övörkhangai, around 230 kilometres (143 miles) south-west from the present site of Ulaanbaatar, and was intended by the Mongol nobles to be the seat of Zanabazar, the first Jebtsundamba Khutughtu. Zanabazar returned to Mongolia from Tibet in 1651, and founded seven aimags (monastic departments) in Urga, later establishing four more. As a mobile monastery-town, it was often moved to various places along the Selenge, Orkhon and Tuul rivers, as supply and other needs would demand. During the Dzungar wars of the late 17th century, it was even moved to Inner Mongolia. As the city grew, it moved less and less. The movements of the city can be detailed as follows: Shireet Tsagaan Nuur (1639), Khoshoo Tsaidam (1640), Khentii Mountains (1654), Ogoomor (1688), Inner Mongolia (1690), Tsetserlegiin Erdene Tolgoi (1700), Daagandel (1719), Usan Seer (1720), Ikh Tamir (1722), Jargalant (1723), Eeven Gol (1724), Khujirtbulan (1729), Burgaltai (1730), Sognogor (1732), Terelj (1733), Uliastai River (1734), Khui Mandal (1736), Khuntsal (1740), Udleg (1742), Ogoomor (1743), Selbe (1747), Uliastai River (1756), Selbe (1762), Khui Mandal (1772) and Selbe (1778). In 1778, the city moved from Khui Mandal and settled for good at its current location, near the confluence of the Selbe and Tuul rivers, and beneath Bogd Khan Uul, at that time also on the caravan route from Beijing to Kyakhta. What they call the Urga is the court, or the place where the prince (Tusheet Khan) and high priest (Bogd Jebtsundamba Khutugtu) reside, who are always encamped at no great distance from one another. They have several thousand tents about them, which are removed from time to time. The Urga is much frequented by merchants from China and Russia, and other places. By Zanabazar's death in 1723, Urga was the Mongolia's preeminent monastery in terms of religious authority. A council of seven of the highest-ranking lamas (Khamba Nomon Khan, Ded Khamba and five Tsorj) made most of the city's religious decisions. 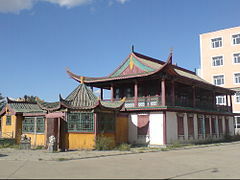 It had also become Outer Mongolia's commercial center. From 1733 to 1778, Urga moved in the vicinity of its present location. In 1754, the Erdene Shanzodba Yam ^ of Urga was given authority to supervise the administrative affairs of the Bogd's subjects. It also served as the city's chief judicial court. In 1758, the Qianlong Emperor appointed the Khalkha Vice General Sanzaidorj as the first Mongol amban of Urga with full authority to "oversee the Khuree and administer well all the Khutugtu's subjects". In 1761, a second amban was appointed for the same purpose, a Manchu one. A quarter-century later, in 1786, a decree issued in Peking gave right to the Urga ambans to decide the administrative affairs of Tusheet Khan and Setsen Khan territories. With this, Urga became the highest civil authority in the country. 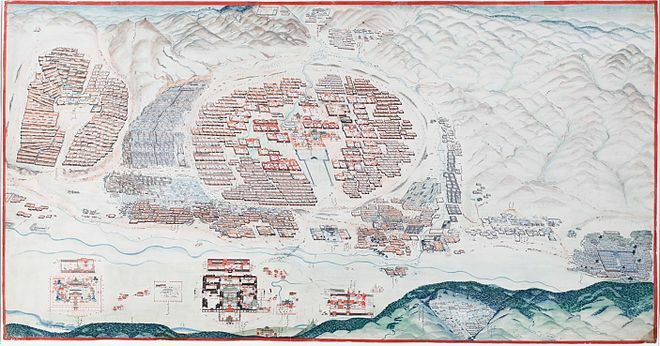 Based on Urga's Mongol governor Sanzaidorj's petition, the Qianlong Emperor officially recognized an annual ceremony on Bogd Khan Mountain in 1778 and provided the annual imperial donations. 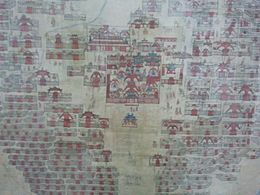 The city was the seat of the Jebtsundamba Khutugtus, two Qing ambans, and a Chinese trade town grew "four trees" or 4.24 km (2.63 mi) east of the city center at the confluence of the Uliastai and Tuul rivers. By 1778, Urga may have had as many as ten thousand monks, who were regulated by a monastic rule, Internal Rule of the Grand Monastery or Yeke Kuriyen-u Doto'adu Durem. For example, in 1797 a decree of the 4th Jebtsundamba forbade "singing, playing with archery, myagman, chess, usury and smoking"). Executions were forbidden where the holy temples of the Bogd Jebtsundama could be seen, so capital punishment took place away from the city. In 1839, the 5th Bogd Jebtsundamba moved his residence to Gandan Hill, an elevated position to the west of the Baruun Damnuurchin markets. Part of the city was moved to nearby Tolgoit. In 1855, the part of the camp that moved to Tolgoit was brought back to its 1778 location, and the 7th Bogd Jebtsundamba returned to the Zuun Khuree. The Gandan Monastery flourished as a center of philosophical studies. Following the Treaty of Kyakhta in 1727, Urga (Ulaanbaatar) was a major point of the Kyakhta trade between Russia and China – mostly Siberian furs for Chinese cloth and later tea. The route ran south to Urga, southeast across the Gobi Desert to Kalgan, and southeast over the mountains to Peking. Urga was also a collection point for goods coming from further west. These were either sent to China or shipped north to Russia via Kyakhta, because of legal restrictions and the lack of good trade routes to the west. By 1908, there was a Russian quarter with a few hundred merchants and a Russian club and informal Russian mayor. 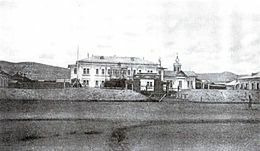 East of the main town was the Russian consulate built in 1863 with an Orthodox church, post office and 20 Cossack guards. It was fortified in 1900 and briefly occupied by troops during the Boxer Rebellion. There was a telegraph line north to Kyakhta and southeast to Kalgan and weekly postal service along these routes. Beyond the Russian consulate was the Chinese trading post called Maimaicheng, and nearby the palace of the Manchu viceroy. With the growth of Western trade at the Chinese ports the tea trade to Russia declined, some Chinese merchants left and wool became the main export. Manufactured goods still came from Russia, but most were now brought from Kalgan by caravan. The annual trade was estimated at 25 million rubles, nine-tenths in Chinese hands and one-tenth in Russian. Sānduō (Chinese: 三多), an ethnic Mongol, was the 62nd and last Qing Amban (1910–1911) of Urga. The Moscow trade expedition of the 1910s estimated the population of Urga at 60,000, based on Nikolay Przhevalsky's study in the 1870s. The city's population swelled during the Naadam festival and major religious festivals to more than 100,000. In 1919, the number of monks had reached 20,000, up from 13,000 in 1810. In 1910, the amban Sando went to quell a major fight between Gandan lamas and Chinese traders started by an incident at the Da Yi Yu shop in the Baruun Damnuurchin market district. He was unable to bring the lamas under control, and was forced to flee back to his quarters. In 1911, with the Qing Dynasty in China headed for total collapse, Mongolian leaders in Ikh Khüree for Naadam met in secret on Mount Bogd Khan Uul and resolved to end 220 years of Manchu control of their country. On 29 December 1911, the 8th Jeptsundamba Khutughtu was declared ruler of an independent Mongolia and assumed the title Bogd Khan. Khüree as the seat of the Jebtsundamba Khutugtu was the logical choice for the capital of the new state. However, in the tripartite Kyakhta agreement of 1915 (between Russia, China, and Mongolia), Mongolia's status was changed to mere autonomy. In 1919, Mongolian nobles, over the opposition of the Bogd Khan, agreed with the Chinese resident Chen Yi on a settlement of the "Mongolian question" along Qing-era lines, but before this settlement could be put into effect, Khüree was occupied by the troops of Chinese warlord Xu Shuzheng, who forced the Mongolian nobles and clergy to renounce autonomy completely. The city changed hands twice in 1921. Firstly, on 4 February, a mixed Russian/Mongolian force led by White Russian warlord Roman von Ungern-Sternberg captured the city, freeing the Bogd Khan from Chinese imprisonment and killing a part of the Chinese garrison. Baron Ungern's capture of Urga was followed by clearing out Mongolia's small gangs of demoralized Chinese soldiers and, at the same time, looting and murder of foreigners, including a vicious pogrom that killed off the Jewish community. On 22 February 1921, the Bogd Khan was once again elevated the Great Khan of Mongolia in Urga. However, at the same time that Baron Ungern was taking control of Urga, a Soviet-supported Communist Mongolian force led by Damdin Sükhbaatar was forming in Russia, and in March they crossed the border. Ungern and his men rode out in May to meet Red Russian and Red Mongolian troops, but suffered a disastrous defeat in June. In July 1921, the Communist Soviet-Mongolian army became the second conquering force in six months to enter Urga. Mongolia came to the control of the Soviet Russia. On 29 October 1924, the town was renamed Ulaanbaatar (Mongolian "red hero"), by the advice of T.R. Ryskulov, the Soviet representative in Mongolia. Green areas were increased in the city center during the communist era. During the socialist period, especially following the Second World War, most of the old ger districts were replaced by Soviet-style blocks of flats, often financed by the Soviet Union. Urban planning began in the 1950s, and most of the city today is the result of construction between 1960 and 1985. The Transmongolian Railway, connecting Ulaanbaatar with Moscow and Beijing, was completed in 1956 and cinemas, theaters, museums etc. were erected. On the other hand, most of the temples and monasteries of pre-socialist Khüree were destroyed following the anti-religious purges of the late 1930s. The Gandan monastery was reopened in 1944 when the U.S. Vice President Henry Wallace asked to see a monastery during his visit to Mongolia. Ulaanbaatar was the site of demonstrations that led to Mongolia's transition to democracy and market economy in 1990. On 10 December 1989, protesters outside the Youth Culture Centre called for Mongolia to implement perestroika and glasnost in their full sense. Dissident leaders demanded free elections and economic reform. On 14 January 1990, the protesters, having grown from two hundred to over a thousand, met at the Lenin Museum in Ulaanbaatar. A demonstration in Sükhbaatar Square on 21 January followed. Afterwards, weekend demonstrations in January and February were held accompanied by the forming of Mongolia's first opposition parties. On 7 March, ten dissidents assembled in Sükhbaatar Square and went on a hunger strike. Thousands of supporters joined them. More arrived the following day and the crowd grew more unruly. 71 people were injured, one fatally. On 9 March, the Communist Mongolian People's Revolutionary Party (MPRP) government resigned. The provisional government announced Mongolia's first free elections, which were held in July. The MPRP won the election and resumed power. Since Mongolia's transition to a market economy in 1990, the city has experienced further growth—especially in the ger districts, as construction of new blocks of flats had basically slowed to a halt in the 1990s. The population has more than doubled to over one million inhabitants. This causes a number of social, environmental, and transportation problems. In recent years, construction of new buildings has gained new momentum, especially in the city center, and apartment prices have skyrocketed. In 2008, Ulaanbaatar was the scene of riots after the Mongolian Democratic, Civic Will Party and Republican parties disputed the Mongolian People's Revolutionary Party's victory in the parliamentary elections. A four-day state of emergency was declared, the capital was placed under a 22:00 to 08:00 curfew, and alcohol sales banned; following these measures, rioting did not resume. This was the first deadly riot in modern Ulaanbaatar's history. In April 2013, Ulaanbaatar hosted the 7th Ministerial Conference of the Community of Democracies, and has also lent its name to the Ulaanbaatar Dialogue on Northeast Asian Security. Since 7 July 2016, the Mayor of Ulaanbaatar and Governor of the Capital City has been Sunduin Batbold (Mongolian People's Party). Ulaanbaatar is located at about 1,350 metres (4,430 ft) above mean sea level, slightly east of the centre of Mongolia on the Tuul River, a sub-tributary of the Selenge, in a valley at the foot of the mountain Bogd Khan Uul. Bogd Khan Uul is a broad, heavily forested mountain rising 2,250 metres (7,380 ft) to the south of Ulaanbaatar. It forms the boundary between the steppe zone to the south and the forest-steppe zone to the north. It is also one of the oldest reserves in the world, being protected by law since the 18th century. The forests of the mountains surrounding Ulaanbaatar are composed of evergreen pines, deciduous larches and birches, while the riverine forest of the Tuul River is composed of broad-leaved, deciduous poplars, elms and willows. As a point of reference, Ulaanbaatar lies on roughly the same latitude as Vienna, Munich, Orléans, and Seattle. It lies on roughly the same longitude as Chongqing, Hanoi and Jakarta. 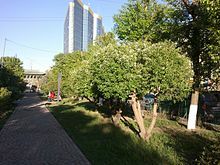 Owing to its high elevation, its relatively high latitude, its location hundreds of kilometres from any coast, and the effects of the Siberian anticyclone, Ulaanbaatar is the coldest national capital in the world, with a monsoon-influenced, cold semi-arid climate (Köppen BSk, USDA Plant Hardiness Zone 3b) that closely borders a subarctic climate (Dwc) and a warm-summer humid continental climate (Dwb). The city features brief, warm summers and long, bitterly cold and dry winters. The coldest January temperatures, usually at the time just before sunrise, are between −36 and −40 °C (−32.8 and −40.0 °F) with no wind, due to temperature inversion. Most of the annual precipitation of 267 millimetres (10.51 in) falls from May to September. The highest recorded precipitation in the city was 659 millimetres or 25.94 inches at the Khureltogoot Astronomical Observatory on Mount Bogd Khan Uul. Ulaanbaatar has an average annual temperature of −0.4 °C or 31.3 °F, making it the coldest capital in the world (as cold as Nuuk, Greenland, but Greenland is not independent). The city lies in the zone of discontinuous permafrost, which means that building is difficult in sheltered aspects that preclude thawing in the summer, but easier on more exposed ones where soils fully thaw. Suburban residents live in traditional yurts that do not protrude into the soil. Extreme temperatures in the city range from −42.2 °C (−44.0 °F) in January and February 1957 to 39.0 °C (102.2 °F) in July 1988. Ulaanbaatar is divided into nine districts (Düüregs): Baganuur, Bagakhangai, Bayangol, Bayanzürkh, Chingeltei, Khan Uul, Nalaikh, Songino Khairkhan and Sükhbaatar. Each district is subdivided into khoroos, of which there are 121. The capital is governed by a city council (the Citizen's Representatives Hural) with forty members, elected every four years. The city council appoints the mayor. When his predecessor became prime minister in January 2006, former city manager Gombosuren Monkhbayar was elected mayor. Ulaanbaatar is governed as an independent first-level region, separate from the surrounding Töv Aimag. The city consists of a central district built in Soviet 1940s- and 1950s-style architecture, surrounded by and mingled with residential concrete towerblocks and large ger districts. In recent years, many of the towerblocks' ground floors have been modified and upgraded to small shops, and many new buildings have been erected—some illegally, as some private companies erect buildings without legal licenses/permits in forbidden places. As the main industrial center of Mongolia, Ulaanbaatar produces a variety of consumer goods  and is responsible for about two-thirds of Mongolia's total gross domestic product (GDP). The transition to a market economy in 1990, which has led to a shift towards service industries making up 43% of the city's GDP, along with rapid urbanization and population growth has so far correlated with an increase in GDP. Mining makes up the second-largest contributor to Ulaanbaatar's GDP at 25%. North of the city are several gold mines, including the Boroo Gold Mine, and foreign investment in the sector has allowed for growth and development. However, in light of a noticeable drop in GDP during the financial crisis of 2008, as demand for mining exports dropped, there has been movement towards diversifying the economy. Mainstream tourist guide books usually recommend the Gandantegchinlen Monastery  with the large Janraisig statue, the socialist monument complex at Zaisan Memorial with its great view over the city, the Winter Palace of the Bogd Khan, Chinggis Square and the nearby Choijin Lama Temple. The city also houses numerous museums, two of the prominent ones being the National Museum of Mongolia and the Zanabazar Fine Arts Museum. Popular destinations for day trips are the Gorkhi-Terelj National Park, the Manzushir monastery ruins on the southern flank of Bogd Khan Uul and Genghis Khan Equestrian Statue. Important shopping districts include the 3rd Microdistrict Boulevard (simply called Khoroolol or "the District"), Peace Avenue around the State Department Store (simply called Ikh Delguur or "Great Store") and the Narantuul "Black Market" area (simply called Zakh or "the Market"). Ulaanbaatar presently has three large cinemas, one modern ski resort, two large indoor stadiums, several large department stores and one large amusement park. Food, entertainment and recreation venues are steadily increasing in variety. KFC, Round Table Pizza, Cinnabon, Louis Vuitton, Ramada and Kempinski have opened branches in key locations. A 309-metre-tall (1,014-foot) tower called the Morin Khuur Tower (Horsehead Fiddle Tower) is planned to be built next to the Central Stadium. It is scheduled to finish in 2018. and the 41-floor Mak Tower being built by South Korean "Lotte Construction and Engineering". 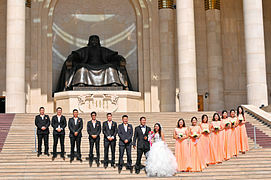 Wedding at the Chinggis Square. 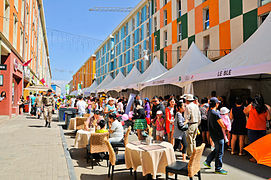 International Food Festival held annually in UB in September. Zaisan Memorial is dedicated to the Russian and Mongolian war hero. 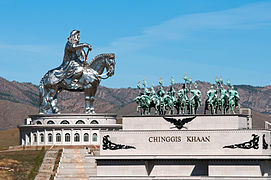 The Chinggis Square and Mongolian Parliament. Aryabal Meditation Center at Gorkhi-Terelj National Park. 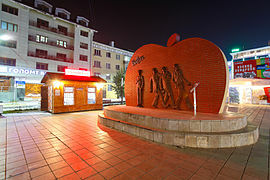 The Beatles monuments is a popular place for the youth of UB to gather around. 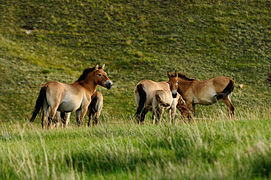 Khustain Nuruu National Park, home of the wild horse Takhi, is just 90 kilometres (56 miles) west of UB. Among the notable older monasteries is the Choijin Lama Monastery, a Buddhist monastery that was completed in 1908. It escaped the destruction of Mongolian monasteries when it was turned into a museum in 1942. Another is the Gandan Monastery, which dates to the 19th century. Its most famous attraction is a 26.5-meter-high golden statue of Migjid Janraisig. These monasteries are among the very few in Mongolia to escape the wholesale destruction of Mongolian monasteries under Khorloogiin Choibalsan. Old Ikh Khüree, once the city was set up as a permanent capital, had a number of palaces and noble residences in an area called Öndgiin sürgiin nutag. The Jebtsundamba Khutughtu, who was later crowned Bogd Khan, had four main imperial residences, which were located between the Middle (Dund gol) and Tuul rivers. 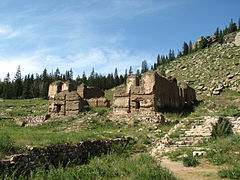 The summer palace was called Erdmiin dalai buyan chuulgan süm or Bogd khaanii serüün ord. Other palaces were the White palace (Tsagaan süm or Gьngaa dejidlin), and the Pandelin palace (also called Naro Kha Chod süm), which was situated in the left bank of Tuul River. Some of the palaces were also used for religious purposes. 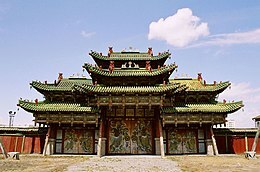 The only palace that remains is the winter palace; the Winter Palace of the Bogd Khan (Bogd khaanii nogoon süm or Bogd khaanii öwliin ordon) remains as a museum of the last monarch. 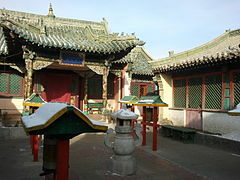 The complex includes six temples, many of the Bogd Khan's and his wife's possessions are on display in the main building. 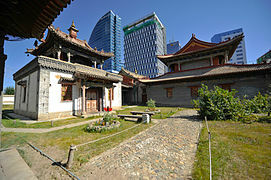 Ulaanbaatar has several museums dedicated to Mongolian history and culture. The Natural History Museum features many dinosaur fossils and meteorites found in Mongolia. The National Museum of Mongolia includes exhibits from prehistoric times through the Mongol Empire to the present. The Zanabazar Museum of Fine Arts has a large collection of Mongolian art, including works of the 17th-century sculptor/artist Zanabazar, as well as Mongolia's most famous painting, One Day In Mongolia by Baldugiin "Marzan" Sharav. The Mongolian Theatre Museum presents the history of the performing arts in Mongolia. The city's former Lenin Museum announced plans in January 2013 to convert to a museum showcasing dinosaur and other prehistoric fossils. Pre-1778 artifacts that never left the city since its founding include the Vajradhara statue made by Zanabazar himself in 1683 (the city's main deity kept at the Vajradhara temple), an ornate throne presented to Zanabazar by the Kangxi Emperor (before 1723), a sandalwood hat presented to Zanabazar by the Dalai Lama (c. 1663), Zanabazar's large fur coat which was also presented by the Kangxi Emperor and a great number of original statues made by Zanabazar (e.g., the Green Tara). The Military Museum of Mongolia's collection consists of two permanent exhibition halls, showcasing the war history of the country from pre-historic times to the modern era. In the first hall, one can see various tools and weapons from Paleolithic age to the times of Manchu empire. The modern history exhibition hall showcases the history of the Mongolian military, starting with the Bogd Khan period (1911-24) up until Mongolia's recent military involvement in peacekeeping operations. Although the building's condition is dire, the Victims of Political Persecution Memorial Museum tells about one of the most tragic history of Mongolia's 20th century. It is dedicated to those fallen under the political purge that took the lives of over 32,000 statesmen, herders, scholars, politicians and lamas. The city's museum offers a view of Ulaanbaatar's history through old maps and photos. The most interesting item is a huge painting of the capital as it looked in 1912 that shows major landmarks such as Gandan Monastery and the Winter Palace of the Bogd Khan. Part of the museum is dedicated to special photo exhibits that change frequently. Mongolian Railway History Museum is an open-air museum that displays 6 types of locomotives used during a 65-year period of Mongolian Railways history. The Puzzle Toys Museum displays a comprehensive collection of complex wooden toys players can assemble. Residence of Prince Chin Wang Khanddorj (Minister of Foreign Affairs), built in 1913. Chinggis Square, in the government district, is the center of Ulaanbaatar. The square is 31,068 square metres (334,413 square feet) in size. In the middle of Sükhbaatar Square, there is a statue of Damdin Sükhbaatar on horseback. The spot was chosen because that was where Sükhbaatar's horse had urinated (considered a good omen) on 8 July 1921 during a gathering of the Red Army. On the north side of Sükhbaatar Square is the Mongolian Parliament building, featuring a large statue of Chinggis Khan at the top of the front steps. Peace Avenue (Enkh Taivny Urgon Chuloo), the main thoroughfare through town, runs along the south side of the square. The Zaisan Memorial, a memorial to Soviet soldiers killed in World War II, sits on a hill south of the city. 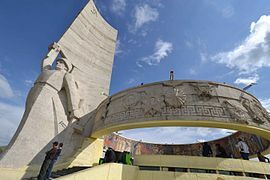 The Zaisan Memorial includes a Soviet tank paid for by the Mongolian people and a circular memorial painting which in the socialist realism style depicts scenes of friendship between the peoples of the Soviet Union and Mongolia. Visitors who make the long climb to the top are rewarded with a panoramic view of the whole city down in the valley. 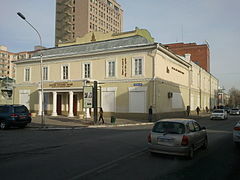 Ulaanbaatar features a mix of traditional and western style theatres, offering world class performances. Many of the traditional folklore bands play regularly around the world including in New York, London and Tokyo. The Ulaanbaatar Opera House, situated in the center of the city, hosts concerts and musical performances. as well as opera and ballet performances, some of them are in collaboration with world ballet houses such as Boston Theatre. The Mongolian State Grand National Orchestra was originally established during Kublai Khan, reestablished in 1945. It has the largest orchestra of traditional instruments in the country with a repertoire going beyond national music, encompassing dozens of international musical pieces. 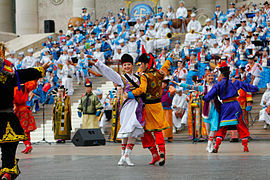 The Tumen Ekh Ensemble comprises artists who perform all types of Mongolian song, music and dance. They play traditional instruments including the morin khuur (horse head fiddle) and perform Mongolian long song, epic and eulogy songs, a ritualistic shaman ritual dance, an ancient palace dance and a Tsam mask dance. The Morin Khuur Ensemble of Mongolia is part of the Mongolian State Philharmonic located at the Chinggis Khan Square. It is a popular ensemble featuring the national string instrument Morin Khuur and performs various domestic and international works. Gorkhi-Terelj National Park is a popular picnic and camping ground all year round. A number of nationally known parks and protected areas belong officially to the city. Gorkhi-Terelj National Park, a nature preserve with many tourist facilities, is approximately 70 km (43 mi) from Ulaanbaatar. It is accessible via paved road. The 40-metre-high (130-foot) Genghis Khan Equestrian Statue, 54 km (34 mi) from Ulaanbaatar, is the largest equestrian statue in the world. National Culture and Recreation Center (Children's Park) is an amusement park located in the downtown section, south of Shangri-La Hotel. It is also a popular place for youngsters to hang out. This small amusement park features rides, games and paddle boats. Its Artificial Lake Castle was built in 1969, when the National Amusement Park was established in the centre of the Mongolian capital Ulaanbaatar. The National Park of Mongolia opened its doors in the southeastern outskirts of the city in 2009, becoming a popular summer park for the UB goers. It has a total area of 55 hectares with over 100K trees planted. The park is geared towards becoming educational center for healthy responsible living as well as environmental education. Among the countries that have diplomatic facilities in Ulaanbaatar are Australia, Austria, Bulgaria, Canada, China, Cuba, Czech Republic, Denmark, Finland, France, Germany, Hungary, India, Italy, Japan, Kazakhstan, Laos, Malaysia, Republic of China (Taiwan), Russia, Slovakia, South Korea, Spain, Sweden, Switzerland, Turkey, Ukraine, UK, USA, and Vietnam. Ulaanbaatar's main religion is Buddhism. The city is also the see of the Roman Catholic missionary circonscription for all (Outer) Mongolia. The apostolic see is the Saints Peter and Paul Cathedral, consecrated in 2003 by Cardinal Crescenzio Sepe. The official symbol of Ulaanbaatar is the garuḍa, a mythical bird in both Buddhist and Hindu scriptures called Khan Garuda or Khangar'd (Mongolian: Хангарьд) by Mongols. The garuḍa appears on Ulaanbaatar's emblem. In its right hand is a key, a symbol of prosperity and openness, and in its left is a lotus flower, a symbol of peace, equality and purity. In its talons it is holding a snake, a symbol of evil of which it is intolerant. On the garuḍa's forehead is the soyombo symbol, which is featured on the flag of Mongolia. The city's flag is sky blue with the garuḍa arms in the center. There are a number of other universities in the city, including Mongolian National University, Humanities University, Institute of Finance and Economics and Raffles International Institute. The National Library of Mongolia has a wide selection of English-language texts on Mongolian subjects. There are many public elementary, middle and high schools. In Mongolia, 1–4th grade is elementary, 5–8th is middle and 9-11 is high school. Additionally, there are many private schools that offer bilingual programs. The National Library of Mongolia is located in Ulaanbaatar and includes an extensive historical collection, items in non-Mongolian languages and a special children's collection. The Metropolitan Central Library of Ulaanbaatar, sometimes also referred to as the Ulaanbaatar Public Library, is a public library with a collection of about 500,000 items. It has an impressive 232,097 annual users and a total of 497,298 loans per year. It does charge users a registration fee of 3800 to 4250 tugrik, or about USD 3.29 to 3.68. The fees may be the result of operating on a budget under $176,000 per year. They also host websites on classical and modern Mongolian literature and food, in addition to providing free Internet access. In 1986, the Ulaanbaatar government created a centralized system for all public libraries in the city, known as the Metropolitan Library System of Ulaanbaatar (MLSU). This system coordinates management, acquisitions, finances and policy among public libraries in the capital, in addition to providing support to school and children's libraries. Other than the Metropolitan Central Library, the MLSU has four branch libraries. 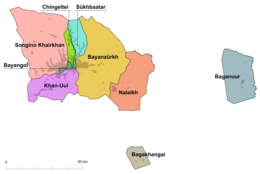 They are in the Chingeltei District (established in 1946), in the Han-Uul District (established in 1948), in the Bayanzurkh District (established in 1968) and in the Songino-Hairkhan District (established in 1991). There is also a Children's Central Library, which was established in 1979. The International Children's Digital Library (ICDL) is an organization that publishes numerous children's books in different languages on the web in child-friendly formats. In 2006 they began service in Mongolia and have made efforts to provide access to the library in rural areas. The ICDL effort in Mongolia is part of a larger project funded by the World Bank and administered by the Mongolian Ministry of Education, Culture and Science, called the Rural Education And Development Project (READ). Since Mongolia lacks a publishing industry, and few children's books, the idea has been to "spur the publishing industry to create 200 new children's books for classroom libraries in grades 1–5." After these books were published and distributed to teachers they were also published online with the rest of the ICDL collection. While a significant portion of this project is supported by outside sources, an important component is to include training of Mongolian staff to make it continue in an effective way. The project is designed to show Mongolia's youth that they can take part in the larger digital culture. The Press Institute in Ulaanbaatar oversees the Digital Archive of Mongolian Newspapers. It is a collection of 45 newspaper titles with a particular focus on the years after the fall of communism in Mongolia. The project was supported by the British Library's "Endangered Archives Programme". The Metropolitan Central Library in Ulaanbaatar maintains a digital monthly news archive. An important resource for academics is the American Center for Mongolian Studies (ACMS), also based in Ulaanbaatar. Its goal is to facilitate research between Mongolia and the rest of the world and to foster academic partnerships. To help achieve this end, it operates a research library with a reading room and computers for Internet access. ACMS has 1,500 volumes related to Mongolia in numerous languages that may be borrowed with a deposit. It also hosts an online library that includes special reference resources and access to digital databases, including a digital book collection. There is a Speaking Library at School #116 for the visually impaired, funded by the Zorig Foundation, and the collection is largely based on materials donated by Mongolian National Radio. "A sizable collection of literature, know-how topics, training materials, music, plays, science broadcasts are now available to the visually impaired at the school." The Mongolia-Japan Center for Human Resources Development maintains a library in Ulaanbaatar consisting of about 7,800 items. The materials in the collection have a strong focus on both aiding Mongolians studying Japanese and books in Japanese about Mongolia. It includes a number of periodicals, textbooks, dictionaries and audio-visual materials. Access to the collection does require payment of a 500 Tugrug fee, though materials are available for loan. They also provide audio-visual equipment for collection use and internet access for an hourly fee. There is an information retrieval reference service for questions that cannot be answered by their collection. There is a manuscript collection at the Danzan Ravjaa Museum of theological, poetic, medicinal, astrological and theatrical works. It consists of literature written and collected by the monk Danzan Ravjaa, who is famous for his poetry. The British Library's Endangered Archives Programme funded a project to take digital images of unique literature in the collection; however, it is not clear where the images are stored today. Ulaanbaatar is served by the Chinggis Khaan International Airport (formerly Buyant Ukhaa Airport). It is 18 km (11 mi) southwest of the city. Currently, the Chinggis Khaan airport is the only airport in Mongolia that offers international flights. In order to serve increased projected passenger numbers, the New Ulaanbaatar International Airport (NUBIA) is being constructed south of the city with plans to replace the Chinggis Khaan airport. Flights to Ulaanbaatar are available from Moscow, Paris, Frankfurt, Berlin, Tokyo, Seoul, Ulan-Ude, Irkutsk, Hong Kong, Beijing, Bishkek and Istanbul. There are rail connections to the Trans-Siberian railway via Naushki and to the Chinese railway system via Jining. Ulaanbaatar is connected by road to most of the major towns in Mongolia, but most roads in Mongolia are unpaved and unmarked, and road travel can be difficult. Even within the city, not all roads are paved and some of the ones that are paved are not in good condition. Existing plans to improve transportation include a subway system, several major road projects such as a 1,000-kilometre-long (620-mile) highway to link Ulaanbaatar to the regions of Altanbulag and Zamyn Uud, plans to upgrade existing regional airports and roadways, and Mongolian Railway projects that will connect cities and mines. Planned Ulaanbaatar subway The central 6.6 km (4.1 mi) will be underground while remaining sections will be elevated. The national and municipal governments regulate a wide system of private transit providers which operate numerous bus lines around the city. There is also an Ulaanbaatar trolleybus system. A secondary transit system of privately owned microbuses (passenger vans) operates alongside these bus lines. Additionally, Ulaanbaatar has over 4000 taxis. The capital has 418.2 km (259.9 mi) of road, of which 76.5 are paved. Air pollution is a serious problem in Ulaanbaatar, especially in winter. Concentrations of certain types of particulate matter (PM10) regularly exceed WHO recommended maximum levels by more than a dozen times. They also exceed the concentrations measured in northern Chinese industrial cities. During the winter months, smoke regularly obscures vision and can even lead to problems with air traffic at the local airport. Sources of the pollution are mainly the simple stoves used for heating and cooking in the city's ger districts, but also the local coal-fueled power plants. The problem is compounded by Ulaanbaatar's location in a valley between relatively high mountains, which shield the city from the winter winds and thus obstruct air circulation. Ulaanbaatar has close ties to cities like Seoul (1,995 kilometres or 1,240 miles from UB), Hong Kong (2,900 kilometres or 1,800 miles from UB), Tokyo (3,010 kilometres or 1,870 miles from UB) and Moscow (4,650 kilometres or 2,890 miles from UB). The Zamyn Uud-Erenhot and Altanbulag-Kyakhta borders are the only places where sustained interaction occurs between Mongolia and its neighbors. Other ports are much smaller. For now Ulaanbaatar remains the main, and almost only, point of contact between Mongolia and its neighbors. Beijing remains the closest global city to Ulaanbaatar. The UB-Peking corridor is served by busy air, rail and road links. In the novel Alas, Babylon by Pat Frank, the city was a relocation site for the Soviet leadership. In the novel it had a medium-wave station for communications. ^ a b ": Нийслэлийн статистикийн газар – Статистик үзүүлэлт – 01. Хүн амын тоо, хүйсээр, оны эхэнд, мянган хүн". Statis.ub.gov.mn. Archived from the original on 2013-12-02. Retrieved 2014-09-07. ^ ": Mongolian statistical information service". www.1212.mn. Archived from the original on 2015-09-19. Retrieved 2015-10-20. ^ a b "Ulaanbaatar Official Web Portal". Ulaanbaatar.mn. Retrieved 24 November 2013. Chisholm, Hugh, ed. (1911). "Urga" . Encyclopædia Britannica. 27 (11th ed.). Cambridge University Press. p. 795. ^ a b "Brief history of Ulaanbaatar". Ulaanbaatar.mn. Archived from the original on 3 December 2013. Retrieved 24 November 2013. ^ Kohn, Michael Lonely Planet Mongolia (4th edition, 2005); ISBN 1-74059-359-6, pg. 52. ^ a b "From Khutagtiin Khuree to Niislel Khuree, Presentation of the Director of the General Archives Authority D. Ulziibaatar", archives.gov.mn; accessed 26 March 2018. ^ Othen, Christopher. "Urga, February 1921". ^ Palmer, James (2009). The Bloody White Baron. ^ Bisher, Jamie. White Terror: Cossack Warlords Of The Trans-Siberian. p. 276. ^ Montsame News Agency. Mongolia. 2006; ISBN 99929-0-627-8, pp. 33-34. ^ "Fatal clashes in Mongolia capital". BBC News. 2 July 2008. Retrieved 26 September 2018. 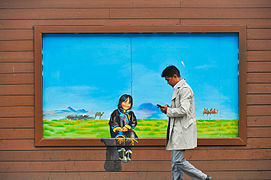 ^ "Streets calm in riot-hit Mongolia". BBC News. 3 July 2008. Retrieved 26 September 2018. ^ "New Mayor of Ulaanbaatar receives seal". Mongolian News Agency. 7 July 2016. Archived from the original on 2016-11-14. Retrieved 14 November 2016. ^ "Hardiness Zones – WORLD MAP". Plantsdb.gr. 15 August 1965. Retrieved 25 November 2013. ^ "Climatological Normals of Ulan Bator". Hong Kong Observatory. Retrieved 14 April 2010. ^ Matt Rosenberg. "Coldest Capital Cities". About.com Education. ^ a b КЛИМАТ УЛАН-БАТОРА (in Russian). Pogoda.ru.net. Retrieved 4 January 2015. ^ "Ulaanbaatar Climate Normals 1961–1990". National Oceanic and Atmospheric Administration. Archived from the original on 2017-10-10. Retrieved 4 January 2015. ^ "Ulaanbaatar". encyclopedia.com. The Columbia Encyclopedia, 6th Edition. Retrieved 13 November 2016. ^ a b Economic Development in Mongolia. The Asia Foundation. Available here[permanent dead link]; accessed 13 November 2016. ^ a b Fan, Peilei; Chen, Jiquan; John, Ranjeet (2016-01-01). "Urbanization and environmental change during the economic transition on the Mongolian Plateau: Hohhot and Ulaanbaatar". Environmental Research. The Provision of Ecosystem Services in Response to Global Change. 144, Part B (Pt B): 96–112. doi:10.1016/j.envres.2015.09.020. PMID 26456409. ^ ctbuh. "CTBUH Joins Launch of Mongolian Tower". www.ctbuh.org. ^ Majer, Zsuzsa; Teleki, Krisztina. 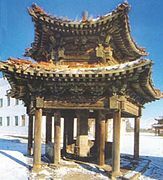 "Monasteries and Temples of Bogdiin Khьree, Ikh Khьree or Urga, the Old Capital City of Mongolia in the First Part of the Twentieth Century" (PDF). Budapest: Documentation of Mongolian Monasteries. p. 36. Archived from the original (PDF) on 27 February 2009. Retrieved 30 January 2009. ^ "National Museum". Nationalmuseum.mn. 21 March 2012. Retrieved 18 April 2012. ^ "Zanazabar Museum of Fine Arts". Zanabazarmuseum.org. Retrieved 2012-04-18. ^ Branigan, Tania. "It's goodbye Lenin, hello dinosaur as fossils head to Mongolia museum". The Guardian. Retrieved 27 January 2013. ^ "Official Website". Archived from the original on 22 December 2015. ^ "Biosphere Reserve Information: BOGD KHAN UUL". ^ "GoAbroad.com". Embassiesabroad.com. Archived from the original on 2009-08-31. Retrieved 18 April 2012. ^ "E Mongol List of Embassies located in Mongolia". E-mongol.com. Retrieved 24 November 2013. ^ "Raffles International Institute (currently the only international degree provider in Mongolia, offering courses accredited by colleges in Australia and Singapore". Raffles.mn. Retrieved 24 November 2013. ^ "International School of Ulaanbaatar". Isumongolia.edu.mn. Archived from the original on 2 December 2013. Retrieved 18 April 2012. ^ a b "Metropolitan Central Library of Ulaanbaatar". Nla.gov.au. 1 March 2004. Retrieved 18 April 2012. ^ "Library of Mongolian State University of Education". ^ "lib.mn". www.aom.lib.mn. Archived from the original on 2004-10-14. Retrieved 2018-12-14. ^ "Монгол Улсын Их Сургууль". www.num.edu.mn. ^ "Library of the Institute of Finance and Economics". Archived from the original on 2011-08-29. Retrieved 2011-08-22. ^ ""Rural Education and Development (READ) Project (formerly Rural Education Support Project)" World Bank". Web.worldbank.org. Retrieved 18 April 2012. ^ "No Hotel, Tent: The International Children's Digital Library Goes to Mongolia". Childrenslibrary.org. Retrieved 26 March 2018. ^ "No Road, Drive: The ICDL Goes to the Mongolian Countryside". Retrieved 28 February 2016. ^ "Digital Librarian Lends Expertise to Mongolian Project". Uwm.edu. Archived from the original on 6 August 2012. Retrieved 18 April 2012. ^ "American Center of Mongolian Studies - ACMS". mongoliacenter.org. ^ "American Center of Mongolian Studies - Library". www.mongoliacenter.org. ^ "American Center for Mongolian Studies Library Homepage. American Center for Mongolian Studies, Ulaanbataar". Mongoliacenter.org. 7 May 2008. Retrieved 18 April 2012. ^ "Speaking Library at School No. 116". Ubpost.mongolnews.mn. 8 November 2007. Retrieved 18 April 2012. ^ "New Ulaanbaatar International Airport". Airport Technology. Retrieved 14 November 2016. ^ "MIAT Route Map". Miat.com. Archived from the original on 8 April 2012. Retrieved 18 April 2012. ^ "Transport in Mongolia". Web.worldbank.org. 20 July 2006. Retrieved 18 April 2012. ^ "Roads Week on WCN: Some of the key current global road projects - World Construction Network". www.worldconstructionnetwork.com. Retrieved 14 November 2016. ^ (http://www.hydrant.co.uk), Site designed and built by Hydrant (19 May 2015). "Major rail projects in Mongolia showing significant progress". Oxford Business Group. Retrieved 14 November 2016. ^ Montsame News Agency. Mongolia. 2006, Foreign Service Office of Montsame News Agency; ISBN 99929-0-627-8, pp. 36, 90. ^ Hasenkopf, Christa. "Clearing the Air". World Policy Journal (Spring 2012). Retrieved 31 May 2012. ^ The World Bank (December 2009). "Mongolia: Air Pollution in Ulaanbaatar – Initial Assessment of Current Situation and Effects of Abatement Measures" (PDF). Sustainable Development Series: Discussion Paper. Washington, D.C.: The World Bank. Retrieved 12 May 2011. ^ "Seoul - Sister Cities[via WayBackMachine]". Seoul Metropolitan Government. Archived from the original on 25 March 2012. Retrieved 23 August 2013. ^ "Внешние связи – Контакты с иностранными городами – Официальный сайт администрации города Красноярска". Admkrsk.ru. Retrieved 25 November 2013. ^ "Chairman of the Committee for External Relations of St Petersburg". Translate.google.com. Retrieved 18 April 2012. ^ "Gold Coast Business News – Sister Cities & International Partnerships". businessgc.com.au. Archived from the original on 2011-07-06. Retrieved 18 April 2012. ^ "Delhi to London, it's a sister act". The Times Of India. 7 July 2002. ^ Frank, Pat (1959). Alas, Babylon. New York: Perennial 2005 (Lippincott 1959). ISBN 978-0-06-074187-7. Wikimedia Commons has media related to Ulaanbaatar. Wikivoyage has a travel guide for Ulaanbaatar.